Definition at line 143 of file ARMConstantPoolValue.h. Definition at line 179 of file ARMConstantPoolValue.h. Definition at line 208 of file ARMConstantPoolValue.cpp. Definition at line 200 of file ARMConstantPoolValue.h. References llvm::ARMConstantPoolValue::isBlockAddress(), llvm::ARMConstantPoolValue::isGlobalValue(), llvm::ARMConstantPoolValue::isLSDA(), and llvm::ARMConstantPoolValue::isPromotedGlobal(). Definition at line 147 of file ARMConstantPoolValue.cpp. Referenced by addExclusiveRegPair(), llvm::ARMTargetLowering::CCAssignFnForReturn(), duplicateCPV(), llvm::ARMTargetLowering::getJumpTableEncoding(), llvm::ARMTargetLowering::isReadOnly(), and promoteToConstantPool(). Definition at line 159 of file ARMConstantPoolValue.cpp. References llvm::ARMCP::CPValue, llvm::Value::getContext(), and llvm::Type::getInt32Ty(). Definition at line 153 of file ARMConstantPoolValue.cpp. Definition at line 167 of file ARMConstantPoolValue.cpp. Definition at line 174 of file ARMConstantPoolValue.cpp. Definition at line 205 of file ARMConstantPoolValue.h. Definition at line 186 of file ARMConstantPoolValue.cpp. 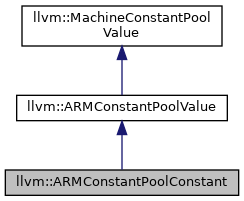 Definition at line 190 of file ARMConstantPoolValue.cpp. Definition at line 182 of file ARMConstantPoolValue.cpp. Definition at line 185 of file ARMConstantPoolValue.h. Definition at line 203 of file ARMConstantPoolValue.cpp. Definition at line 215 of file ARMConstantPoolValue.cpp. References llvm::ARMConstantPoolValue::ARMConstantPoolValue(), llvm::ARMCP::CPExtSymbol, and llvm::ARMConstantPoolValue::print(). Definition at line 181 of file ARMConstantPoolValue.h. References llvm::SmallPtrSetImpl< PtrType >::begin(), and llvm::SmallPtrSetImpl< PtrType >::end().